A lovely wooded walk along the shore of Loch Lomond for 7 miles (11km, 2-1/4 to 3-1/2hrs), away from both traffic and tourists. Within a short distance there is a choice of routes. The easier high route stays on the undulating forestry track passing several waterfalls and yielding occasional surprise views through the trees. A harder alternative route drops down to the loch on a small path which forges a tortuous route clinging as close to the shore as it dares. Many short, steep climbs, fallen trees and rocky sections make the going slow and arduous. The rewards for this are being immersed in glorious oak woods with wonderful lochside views. 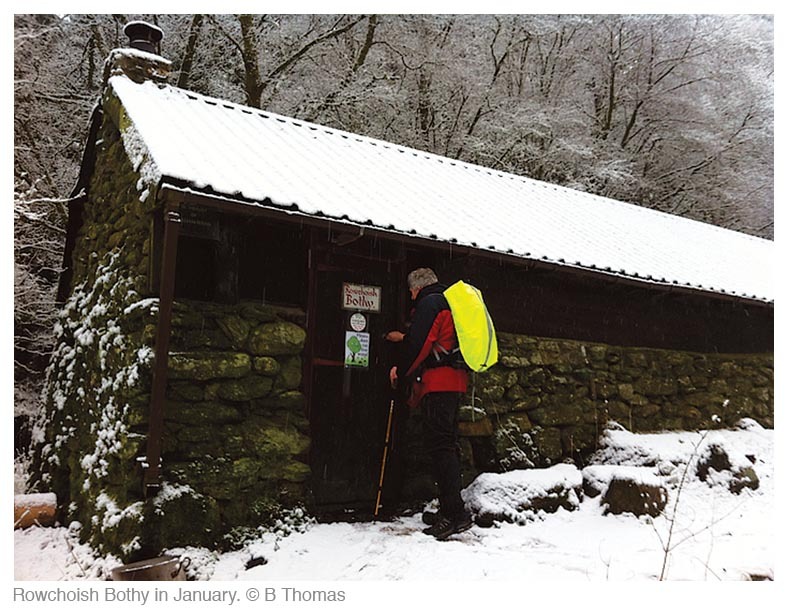 The two routes rejoin just beyond Rowchoish Bothy (see Map 17), a simple shelter with sleeping platform and fire. The Way continues on a well-made path along the shore through further stretches of old oak woodland. If you take the high route you will reach Inversnaid Hotel in 2-1/4 to 3 hours. Via the low route it will take 2-1/2 to 3-1/2 hours. Inversnaid Bunkhouse (â˜Ž 01877-386249, www.inversnaid.com; Mar-Oct), housed in what was once a church (some of the stained-glass windows are still in situ), is a remote and cosy place which offers a range of accommodation. A free pick-up service from the Way is available, which is useful, considering its location 800m uphill from the Way (just follow the road up from the hotel). A bed/bunk bed in the bunkhouse (27 beds; 2T/two 3-bed/two 4-bed rooms, one 5-bed dorm; ïƒµ; wi-fi; â“) costs £17.50-22pp. They also have a log cabin (2D; shared facilities; £57 per cabin) and a studio (2D en suite). The rate for campers is £10pp (ïƒµ; â“) including use of the self-catering kitchen (8-9am & 6-8pm) and other facilities such as wi-fi. However, the Top Bunk Bistro, a licensed restaurant serves food (Mar-Oct daily 7.30-9.15am, noon-3pm & 6-9pm). A buffet continental breakfast costs £4.95 (£7.95 for a full Scottish) and an evening meal costs from £7.95; it is recommended that non residents book for meals. They have a hot tub (£3 per session; 30 mins), a laundry service (wash and dry £5 per load) and some evening entertainment. Group accommodation only between November and March. Inversnaid Hotel (â˜Ž 01877-386223, www.lochsandglens.com; 10S/92D/4Tr, all en suite; ï‚½; wi-fi in downstairs public areas; â“; £25pp, sgl £35, three sharing £25pp; Mar-Oct) is a welcome relief for many walkers as it’s the only place right on the Way between Rowardennan and Inverarnan that provides food and drink. The walkers’ entrance is next to a lounge area where there are coat hooks for wet coats and it’s appreciated if you also remove muddy boots. The bar serves good-value food (Easter-Oct daily 11am-4pm and 6.15-8pm). Take-away meals, such as burgers & chips (£7.50), are served 11am-4pm & 5-8pm; sandwiches are available all day. There’s also a restaurant. 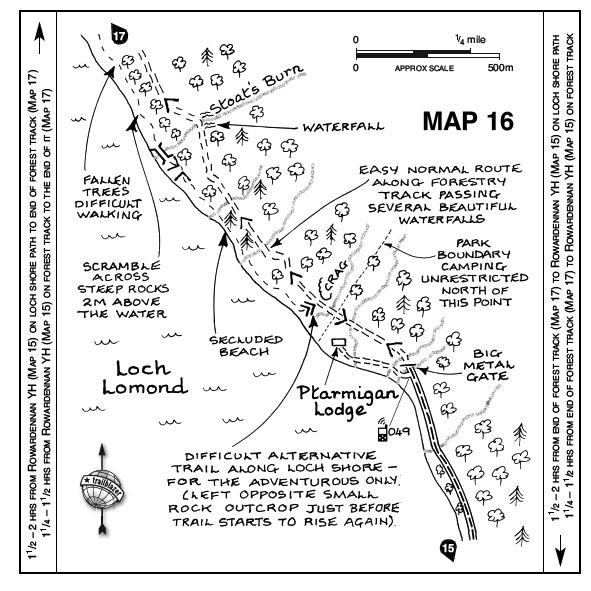 If you wish to cross Loch Lomond from the jetty here to Inveruglas where it is possible to flag down the Citylink coaches (Nos 914, 915 & 916) on the A82, contact Cruise Loch Lomond (see p45) whose scheduled West Highland Way Rambler cruises call here. The hotel used to operate their own boat and it may be worth asking if this has been reinstated. Five minutes north of the hotel is a lovely clearing on the loch shore beyond the boathouse where backpackers can camp for free. All that is asked is that you stay only one night and don’t light a fire. Campers can use the facilities in the bar (till 11pm). The concealed entrance to Rob Roy’s cave (see Map 19), supposedly a hideaway of the Highland hero, is thoughtfully marked with a large ‘CAVE’ in white graffiti by the entrance. It’s quite a scramble to get there and there’s not a lot to see. If you want to explore take a torch with you so that you can investigate the nooks and crannies. Judging by the amount of droppings on the floor it’s used more by errant sheep and goats than clandestine men. Rob Roy MacGregor, the Robin Hood of the Highlands, was born in 1671, the third son of a clan chieftain. Like many Highlanders of the time he made a living by dealing cattle, both legally and illegally, and would occasionally set off for the Lowlands on cattle raids. Part of this ‘business’ was the taking of protection money. By the time he was 40 he had acquired a sizeable amount of land and was prospering as a dealer. He was well known throughout Scotland for being a fair businessman, fine swordsman and for his good looks and wild red hair earning him the Gaelic nickname ‘Ruadh’, meaning red, which became Anglicised to ‘Roy’. His infamous career as a bandit began when he made one deal too many. He had borrowed the large sum of £1000 from the Duke of Montrose to complete a transaction, but his trusted drover ran off with the money leaving Rob a wanted man. The duke seized his land and declared Rob an outlaw. Given refuge and encouragement by a distant relation, the Duke of Argyll, Rob set off on many rustling raids against their common enemy, Montrose. He was on the run for over 10 years and was captured several times but always managed to escape in daring ways, boosting his image. In the end he turned himself in, was threatened with deportation but was eventually pardoned by the king. He lived out his final years in relative peace at home, with his wife, where he died aged 63. Sir Walter Scott, the prolific 19th-century Scottish writer, did more for the reputation of Rob MacGregor than a lifetime of brigandry could ever achieve. In 1818 he published the highly romanticised novel, Rob Roy, which not only took the tale to a wider audience but also ensured that Loch Lomond became a key sight on any tour of the Highlands. By the time William Wordsworth’s sister, Dorothy, came to see the cave in 1822 there was the full tourist set-up of lake steamer, Highland piper and boys selling trinkets. If anything, the cave is a quieter place today.